China says it wouldn't step up its purchases of American products if Trump goes ahead with his tax threat. BEIJING — China said Sunday it wouldn’t step up its purchases of American products if President Trump goes ahead with his threat to tax billions of dollars’ worth of Chinese imports. White House advisers insisted on fundamental changes in ties between the world’s two biggest economic powers. 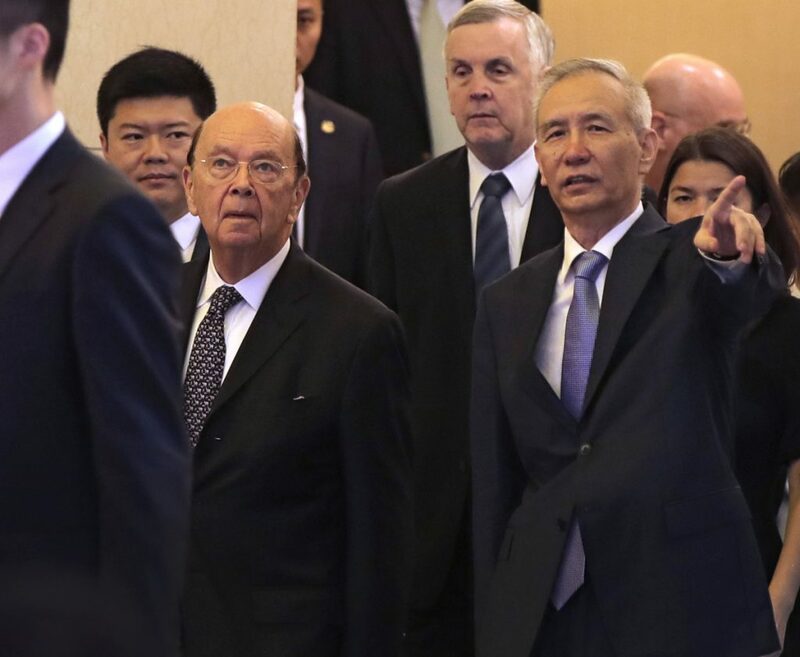 China’s warning came after delegations led by U.S. Commerce Secretary Wilbur Ross and China’s top economic official, Vice Premier Liu He, wrapped up a meeting on Beijing’s pledge to narrow its trade surplus. Ross said at the start of the event they had discussed specific American exports China might purchase, but the talks ended with no joint statement and neither side released details. Asked specifically on Fox’s “Sunday Morning Futures” if the U.S. is willing to throw away its relationship with China by proceeding with threatened tariff hikes, Peter Navarro, director of the White House National Trade Council, pointed in part to an unfair relationship involving a multi-billion dollar trade deficit, Defense Secretary Jim Mattis’ warning of China’s activities in the South China Sea and the threat of China stealing U.S. intellectual property. The United States has threatened to impose tariffs on up to $50 billion of Chinese products in a dispute over Beijing’s aggressive tactics to challenge U.S. technological dominance; Trump has asked U.S. Trade Rep. Robert Lighthizer to look for another $100 billion in Chinese products to tax. China has targeted $50 billion in U.S. products in retaliation. Tensions temporarily eased on May 19 after China promised to “significantly increase” its purchases of U.S. farm, energy and other products. Treasury Secretary Steven Mnuchin said then that the U.S. tariffs were suspended and the trade war “on hold.” The purchases are meant to reduce America’s massive trade deficit in goods and services with China, which last year came to $337 billion, according to the U.S. Commerce Department. “If the United States introduces trade sanctions including a tariff increase, all the economic and trade achievements negotiated by the two parties will not take effect,” said a Chinese government statement, carried by the official Xinhua News Agency. The negotiating process should be “based on the premise” of not fighting a “trade war,” the statement said. The dispute with China comes at the same time Trump has riled some of America’s closest allies with the imposition of tariffs on steel and aluminum imports.